Beginning with Revelation chapter 5 till chapter 16 the Bible proof once more it’s divine source. The seven seals describes the unfolding of events from 1914 till to the end of this world. Very interesting is the aspect that the seventh seal contains all seven trumpets and the seven bowls. Again the seventh trumpet contains the seventh bowl. One could think that all 21 elements are in series, but the seventh seal returns back in time in the year 1922 and describes the last days from another point of view and other aspects are mentioned. 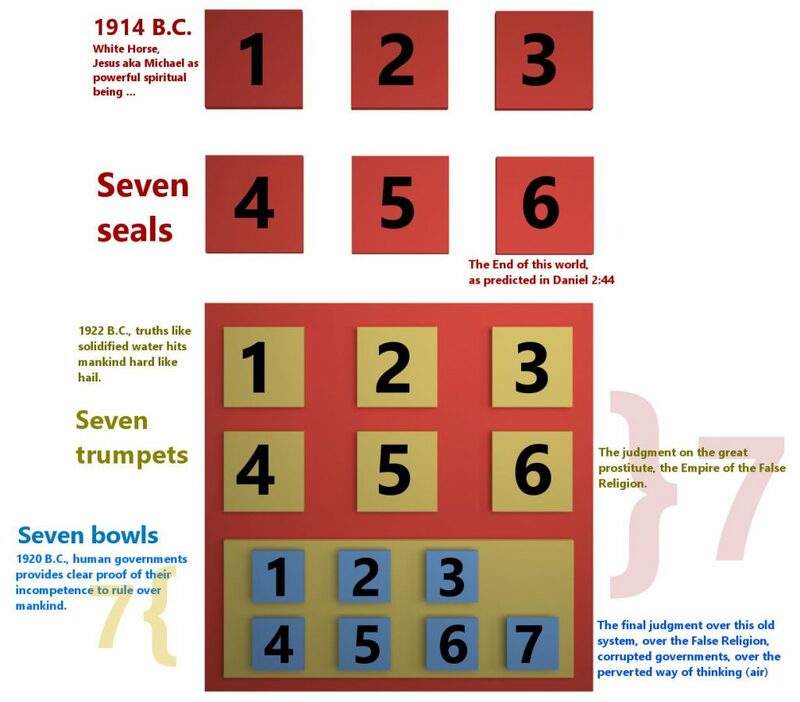 The same with the seventh trumpet, it contains the seven bowls, which first bowl goes again back in time to the year 1920 and describes how this system delivers undeniable proof of it’s incompetence. When the seventh seal is completed also the seventh trumpet and the seventh bowl are completed (King James version says “It is done!”). This is a fractal description from a higher source. Such a way to describe the unfolding of events is similar to the a alchemical purification of elements. Indeed we know today that consciousness is fractal (self-similar) in it’s nature. They symbolism of seven seven seven (777) represents completeness, and the book deals with the completion of the sacred secret of God. In contrast is the number 666, which means absolute imperfection and incompetency of the human governments to rule over mankind and finally also their annihilation by God’s heavenly kingdom at Armageddon.